I’ve had toast on my mind this past week, specifically toast for the Halloween weekend showing of Rocky Horror Picture Show at the old Admiral Theater in West Seattle. Last Halloween, our family (including Mohammad, our exchange student from Saudi Arabia) joined friends for the midnight Rocky Horror show. We had a blast! We sang along and danced the Time Warp and threw rice, toast, playing cards and rolls of TP. 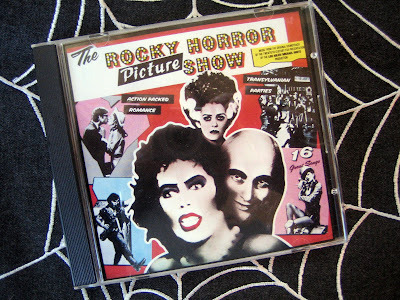 (Friendly reminder from the staff at the Admiral Theater: “Remember to throw the TP up and back!”) All of the parents in our group were transported back to high school and college days; I can’t tell you how many times I saw Rocky Horror at the Harvard Square theater in Cambridge, MA! The kids were somewhere between entertained, shocked and mortified. Mohammad took it all in stride... another day in America, I guess. As I assembled our prop bags for this Halloween’s showing, I began to think about what I could cook with a fun Rocky Horror theme for our house guests visiting for the weekend. A rice dish? Or how about toast? Since I’d be serving breakfast on Sunday morning after the show, French toast seemed the perfect choice. And, of course, I had to make it seasonal so I created a version with butternut squash. Slice the loaf of bread into 8-10 slices (depending upon the length of the loaf). In a large mixing bowl, stir together the squash puree, milk, eggs, vanilla and syrup. Dunk each slice of bread into the mixture and coat. Stack the slices in the bowl and spoon any liquid over the bread. Leave to soak for half an hour. Melt some butter in a large skillet over medium heat. Place 3-4 slices of soaked bread in the pan and fry until golden brown. Flip and fry the other side until golden. Turn the heat down if it’s cooking too fast or getting too dark. 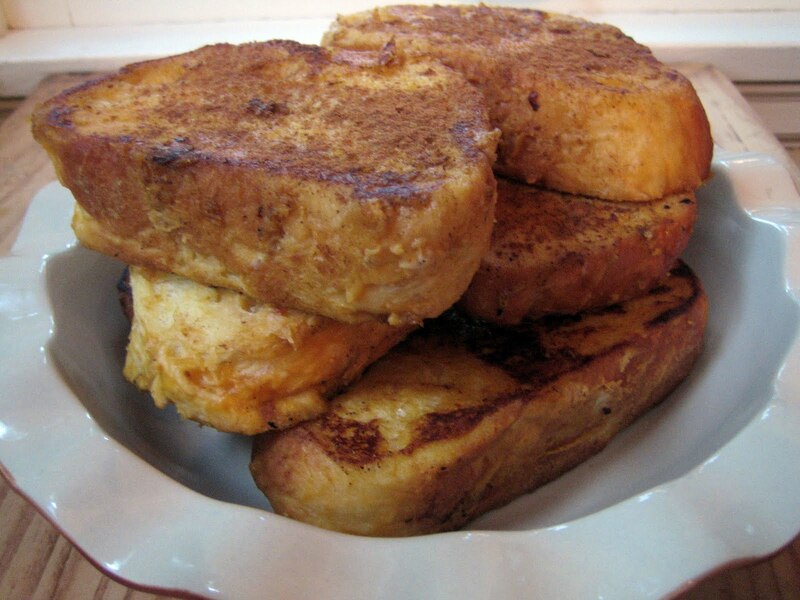 Remove the French toast slices to an oven proof pan and keep warm in a low oven. Repeat frying with the remaining slices. When ready to eat, sprinkle with cinnamon and serve with maple syrup. We have some dear friends visiting for the weekend! Dan and Jacob arrived last night and it’s always special to get time with them. This morning Dan headed to a conference and my family took off for work and school. This means Jacob (who is 7) and I get to spend the day together and I have really been looking forward to this time! We have big plans ... a visit to the zoo, a stop at Top Pot Doughnuts, Lego playing, Mad Libs – and, of course, some baking. Jacob already helped knead the challah dough for tonight. I have other treats planned, too. This is Halloween weekend, after all! 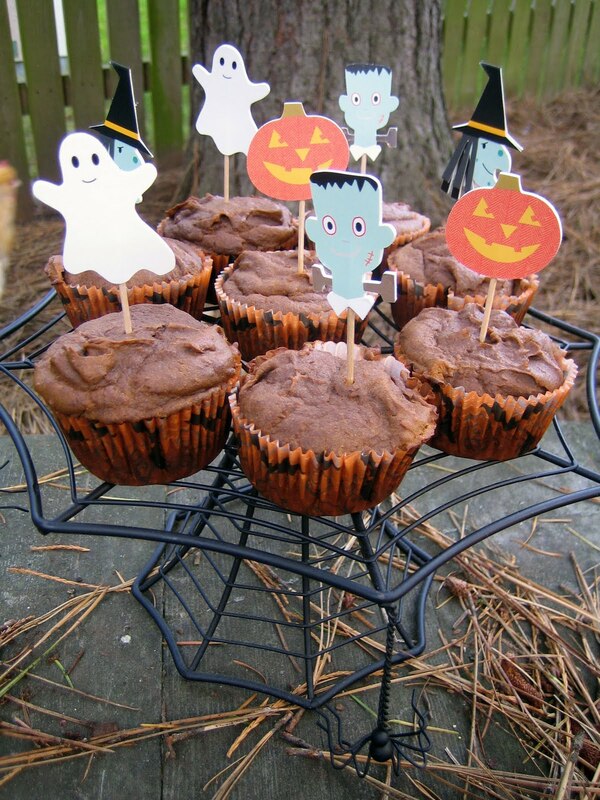 Tomorrow we are all going to carve pumpkins, and I’ve baked some Sweet Potato and Molasses Muffins to eat while creating our jack-o-lantern masterpieces. 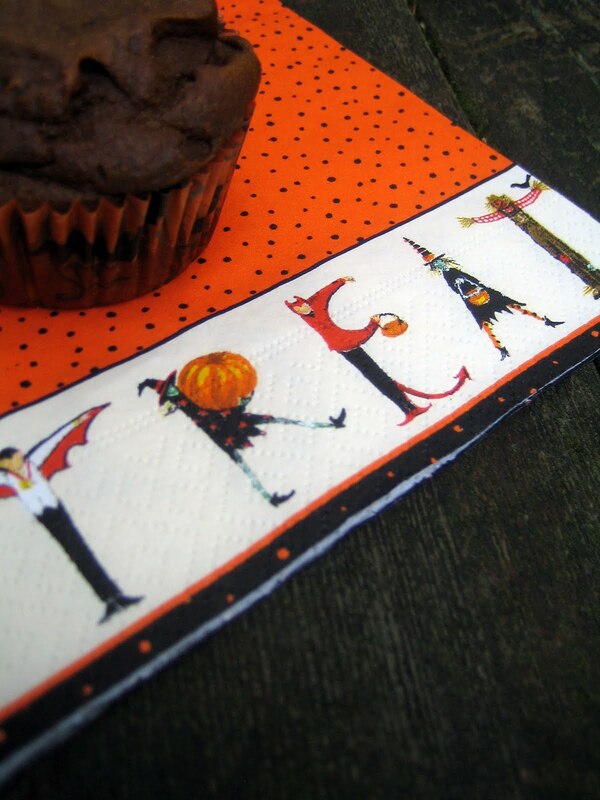 The muffins will go with a lunch of eyeball chili, spider web pizzas, apple cider and hot chocolate. I do love Halloween! These muffins make a wholesome snack or would be a tasty addition to your pre trick-or-treating dinner. They are full of roasted sweet potatoes, some whole wheat flour and sweetened with molasses. I use blackstrap molasses for more molasses punch, but if you prefer a more subtle flavor you can use light molasses (this will also give your muffins more orange color). I’ve also used a 15 ounce can of butternut squash puree before when I didn’t have time to roast the sweet potatoes, and this worked deliciously, as well. I’m off to the zoo with Jacob! Enjoy your Halloween weekend! Preheat the oven to 400 degrees. Butter or line a muffin tin with paper cups. 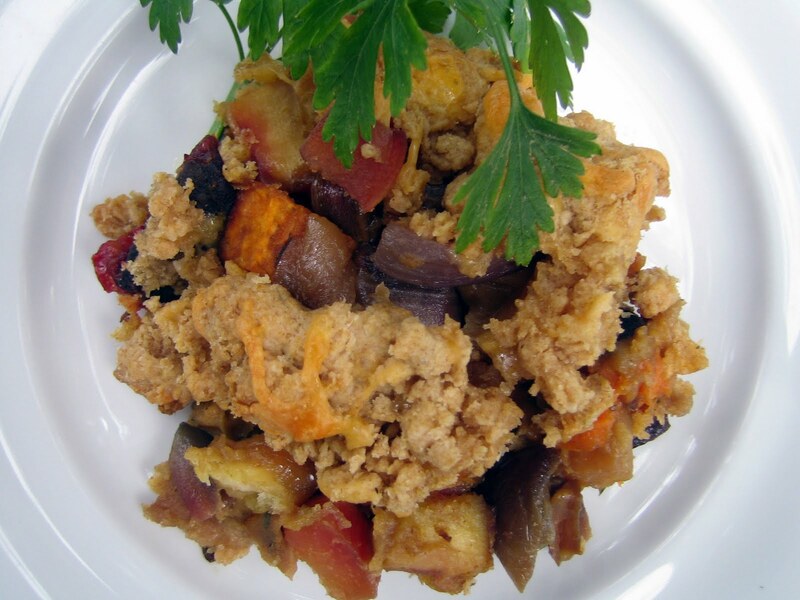 In a large bowl, stir together the sweet potato puree, eggs, milk, molasses and butter. Mix in remaining ingredients and stir until just mixed. Divide batter among the 12 cups. Bake for about 20 minutes, until a tester inserted comes out with a just a few moist crumbs. Serve warm or room temperature. During the years I was cooking at Hillel for the UW students, I created hundreds of dinners for Shabbat and the holidays. 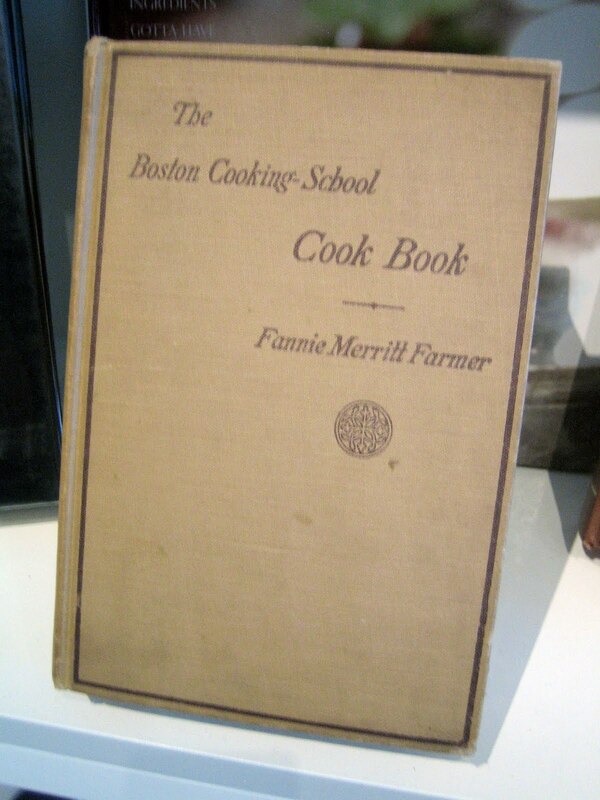 Whenever we served chicken or beef for dinner, we always offered a vegetarian entrée alongside. One of my most requested vegetarian dishes for the fall months was sweet and sour lentils served in a bowl of steamed squash. Now, I am a bit biased since I adore lentils – red, brown, green ... all of them. But I must say, this is a lovely lentil recipe. The sweet and sour flavor comes from adding honey or maple syrup and red wine vinegar. 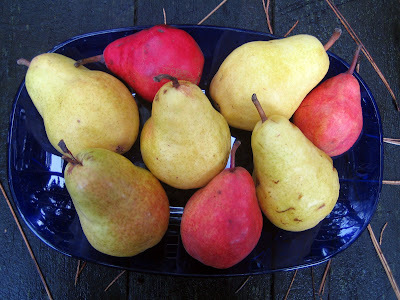 I include apples for more fall essence, but pears or quince would be nice, too. It’s certainly not a pretty dish – very brown – so you do need a sprig of something green to jazz it up. What it lacks in looks, though, it makes up for in taste. 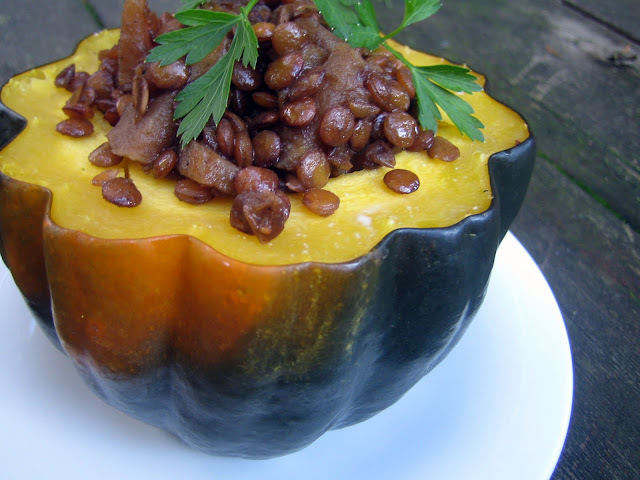 I usually serve these lentils in acorn squash halves, but I’ve also spooned them over spaghetti squash. 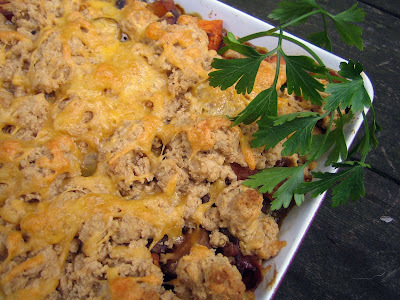 It’s tasty warm or room temperature, making it ideal to feed a crowd at a potluck (or some hungry college students!). And did I mention it’s inexpensive, freezes well, is vegan and can be gluten-free if you use tamari in place of the soy sauce? Whew, that’s a lot of virtues for one dish! Let the humble lentil shine! In a medium sized saucepan, stir together the first nine ingredients. Add the lentils and mix well. Bring to a boil, cover, turn the heat down and let simmer for about an hour, stirring a few times and tossing the diced apple into the saucepan after the first 20 minutes. Check to see if the lentils are soft and the liquid has thickened. If too liquidy, let simmer uncovered near the end. The lentils should have the consistency of a thick sauce. 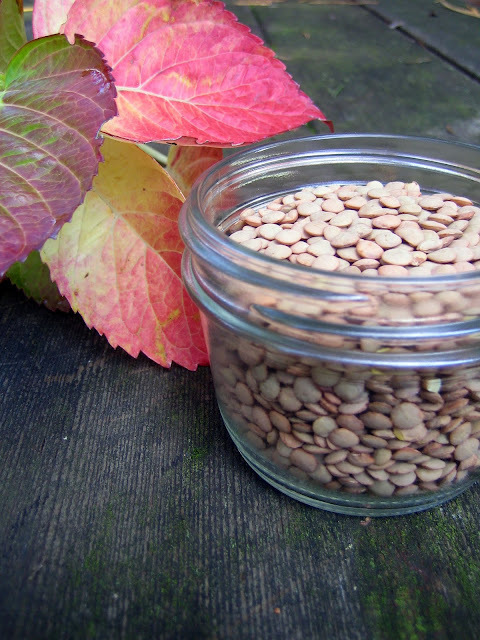 While the lentils are cooking, preheat oven to 400 degrees. Place the 4 squash halves in a roasting dish (cut a small slice off the bottom of each if needed so they sit securely) and add about an inch of water to the pan. Cover with foil and place in the oven. Steam the squash until tender, about 30-45 minutes depending upon how large they are. Remove from oven and set aside until lentils are cooked. Place the squash halves on a serving platter and season to taste with salt and pepper. Spoon the lentils into each half and top with a sprig of parsley. If making ahead: Prepare the squash and lentils and keep separate. 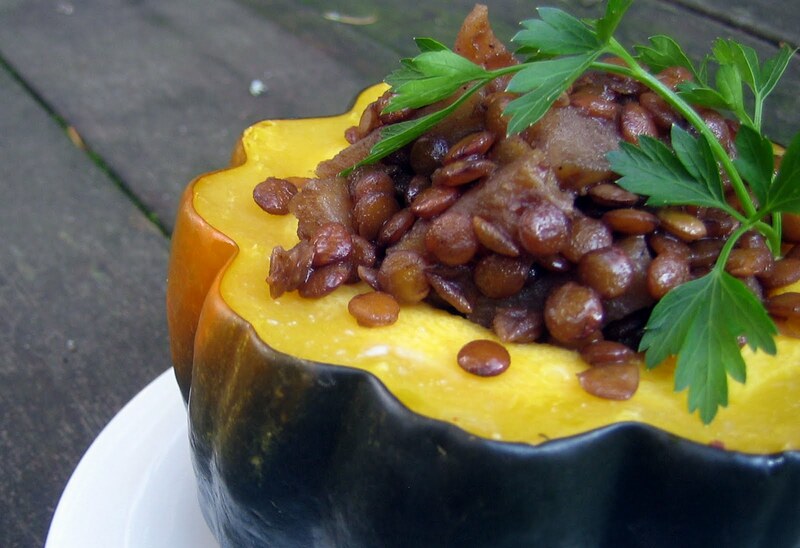 When close to serving, spoon the lentils into the squash and warm in the oven. Did you know that in the mid-1800s, cookies were referred to as jumbles? I learned this in The Essential New York Times Cook Book and I think this early name is delightful. I have an image of a creation that is jumbled together using simple, homey ingredients. I’ve named one of my favorite cookies a jumble because, well – I just think “jumble” when I look at them! And with pumpkins in season and Halloween approaching, I want to share them with you. 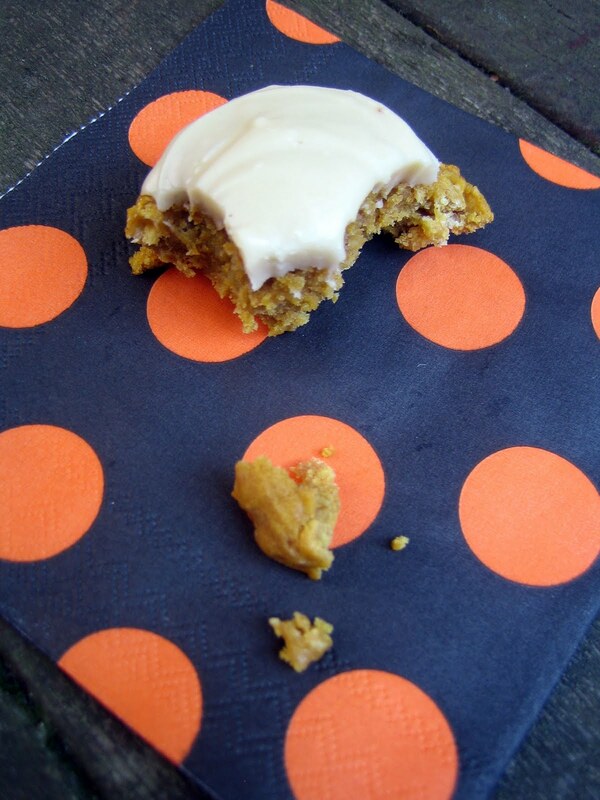 You may have noticed that I adore pumpkin in any form, savory or sweet! Today I’m going with a sweet option. These cookies are thick and soft, almost cake-like. I’ve added chocolate chips to them in the past, and you can certainly do this if you’d like, but I find I prefer their pure pumpkin flavor (and these do pack a lot of pumpkin flavor). The cookies are made more wholesome with the addition of oats and some whole wheat flour – so you can feel a little bit virtuous indulging in them! But did I mention the brown butter glaze? Oh my ... brown butter makes everything insanely delicious. I remember the first time I made brown butter, watching the brown flecks appear and swirl in the pan, while inhaling the heavenly scent. Anytime you need melted butter for a recipe, it’s worth taking the extra time to brown it. It especially enhances fall produce like apples and squash beautifully. 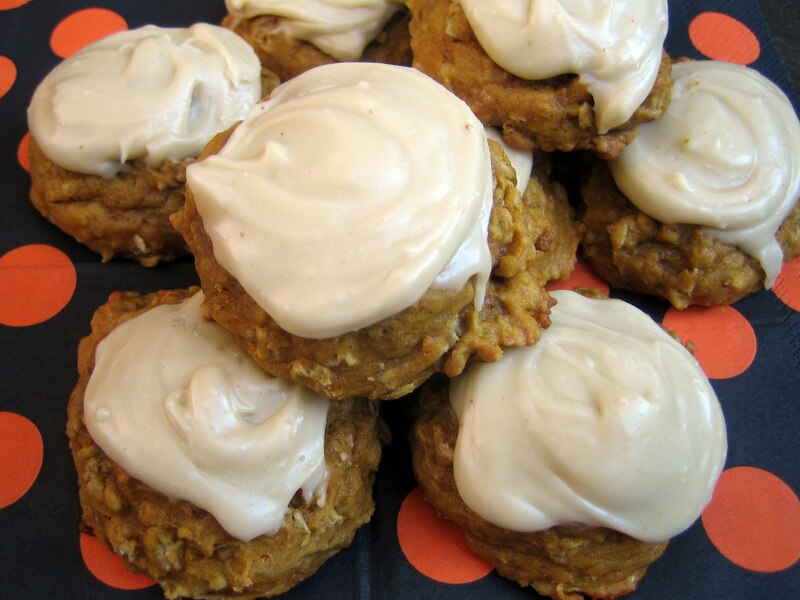 This nutty, buttery glaze elevates these pumpkin cookies to new heights, making them a delectable Halloween (or anytime) treat. In a large bowl, beat the butter and sugars together until fluffy and smooth. Add in the vanilla, cinnamon, nutmeg, baking soda and salt. Beat in the egg, then slowly beat in the oats. 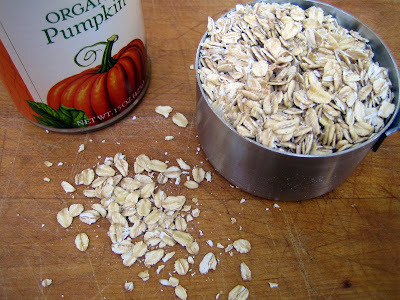 Add the flours in alternately with the pumpkin puree. Chill the dough for at least an hour. Preheat the oven to 400 degrees. Line a baking sheet with parchment paper. Using a large cookie scoop (mine is about 1/4 cup) or large spoon, drop balls of dough onto the cookie sheet (9-10 at a time). Bake for 14 minutes, until they’re set. Let cool for 10 minutes and then remove from pan. The cookies will be soft. 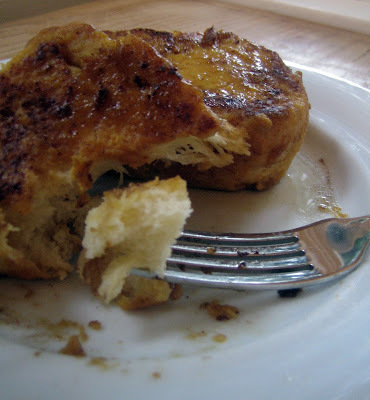 Drizzle with Brown Butter Glaze (recipe follows) or serve plain. Melt the butter in a small sauce pan over medium heat and cook until it is golden brown and has little flecks in it, about 3-4 minutes (watch closely). Immediately pour the butter over the powdered sugar and scrape the pan to get the brown bits. Stir together and add in the milk, one tablespoon at a time until a smooth glaze is formed. Use the glaze right away, since it will harden. Is this a familiar sight in your garden right now? 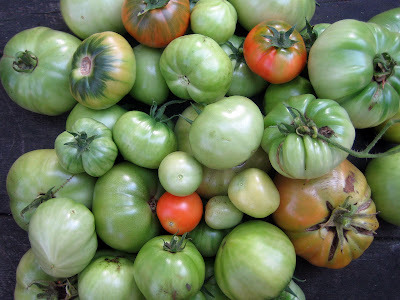 Summer came late to Seattle, and as a result we have green tomatoes ... lots of them. I usually have only a few left at the end of the season so I just toss them in a paper bag to ripen in a cool spot. This year, I decided it was time to make something with these green beauties. I’m familiar with fried green tomatoes (and loved the movie by the same name! ), but wanted to discover a new way of enjoying them. Enter chutney! At the library, I recently found a book called Preserved. The title says it all. 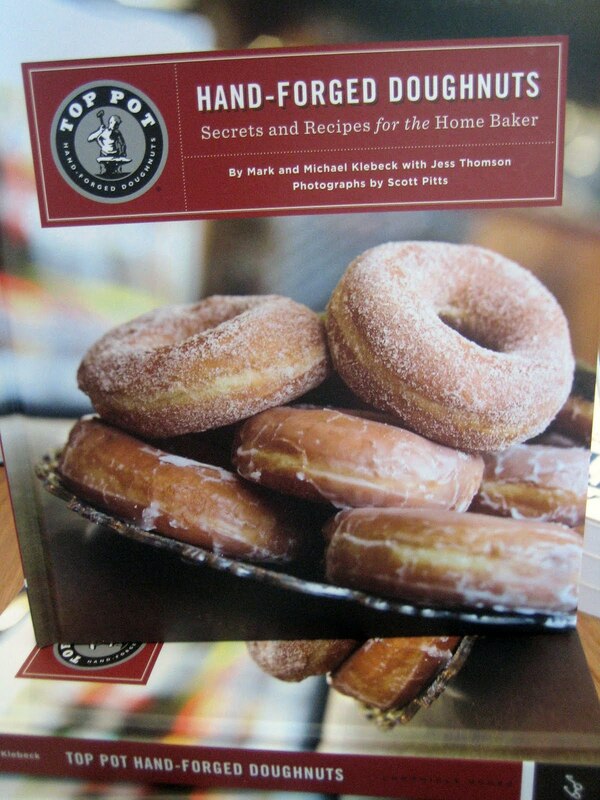 The authors share techniques and recipes for preserving food by salting, drying, smoking, pickling, fermenting, freezing, canning, or using sugar or alcohol. 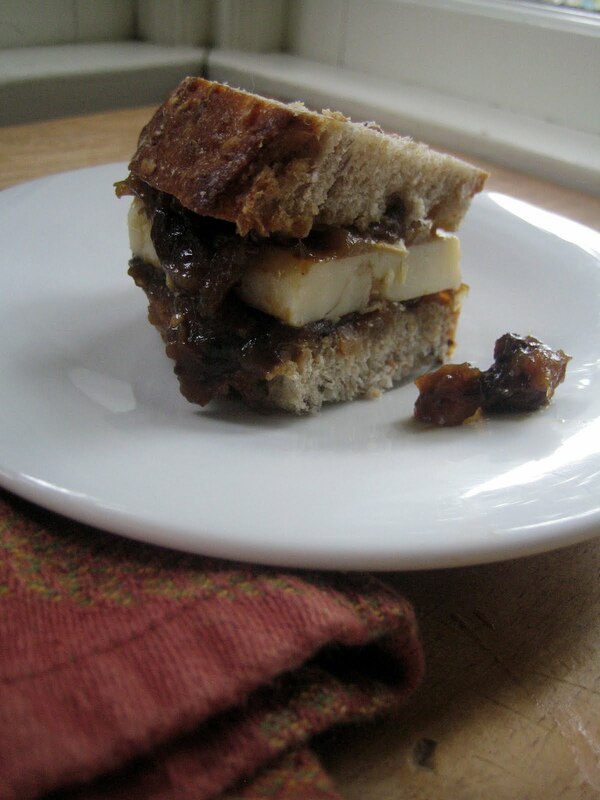 Chutney falls under the sugar category, along with jams, jellies, curds and compotes. 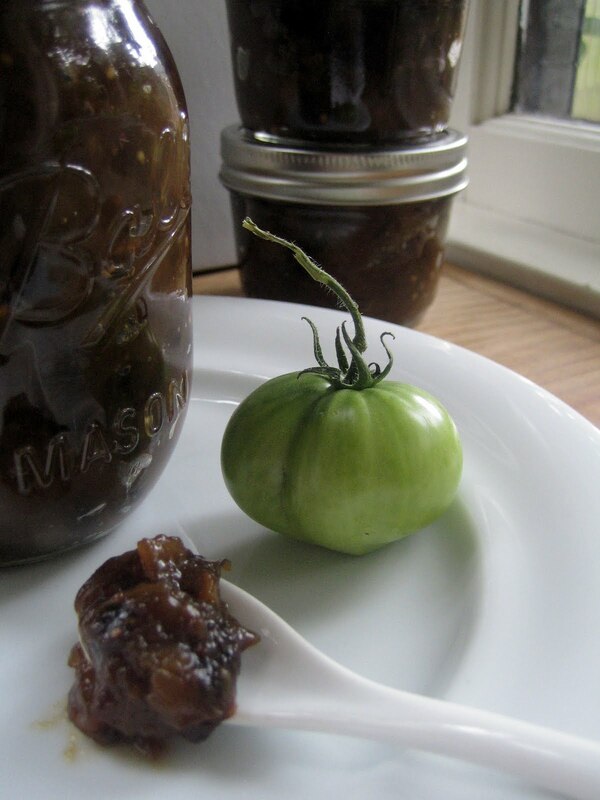 This green tomato chutney is adapted from a recipe I found in Preserved. The house smelled warm and spicy while the chutney simmered on the stove, and although chutney’s flavor improves over time, we found it to be delicious right out of the pot. I’ve tucked a jar away to taste in a month, and have one open in the fridge to eat now. 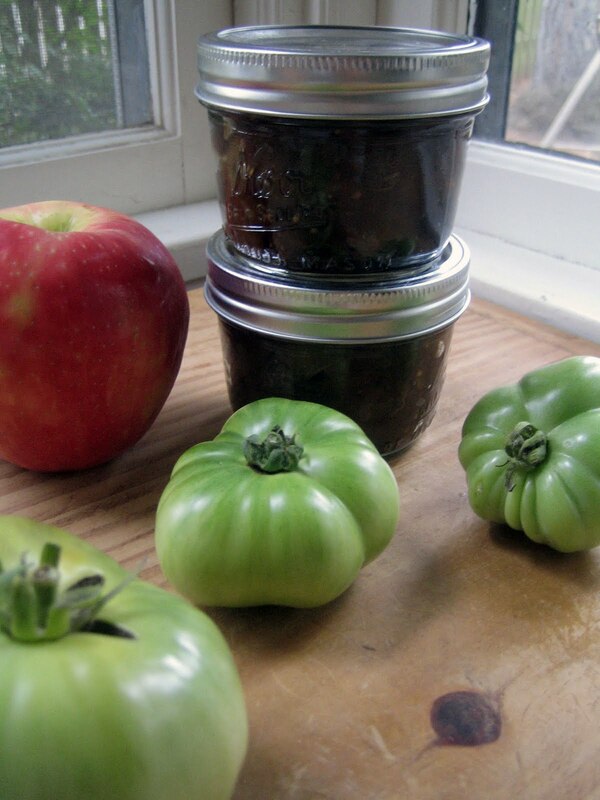 With the green tomatoes and apples in this chutney, it’s a very autumn-like condiment. I can also tell you that the chutney makes a marvelous lunch when slathered on hearty bread with a thick slice of sharp cheddar cheese, eaten by a window dripping with rain drops. It would also be a welcome addition on your holiday table. Turn on your broiler and raise a rack to the top shelf in your oven. On a rimmed baking sheet, toss the green tomatoes with a little bit of olive oil. Broil them until they begin to blacken at the edges and turn golden, stirring a couple of times. Remove from the oven. 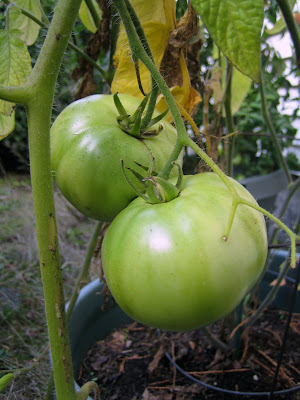 In a large pot, mix together the rest of the ingredients and add the green tomatoes. Stir to combine. Bring the mixture to a boil and then lower the heat and simmer for 2 hours, stirring occasionally. I covered my pot for about 1 1/2 hours, then uncovered and mashed the tomatoes and apples a bit. I kept the pot uncovered to thicken more for the last half hour. Watch to be sure it doesn’t begin to stick or burn on the bottom. Lower the heat if necessary. When cool, ladle into 2 pint jars and cover. The chutney will keep in the fridge for up to 3 months unopened, and 6 weeks once opened. 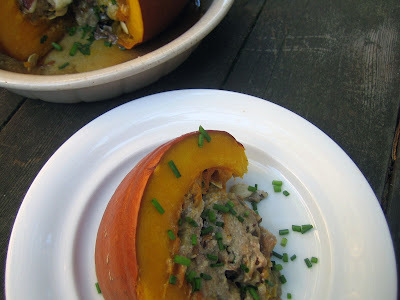 Remember my inspiration to try stuffed pumpkin from a couple of days ago? 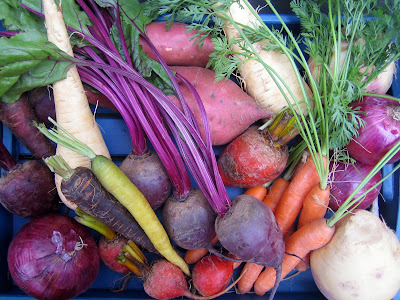 I thought this would be a terrific recipe to make and share for the Unprocessed October challenge (eating food made from scratch using quality, whole ingredients). 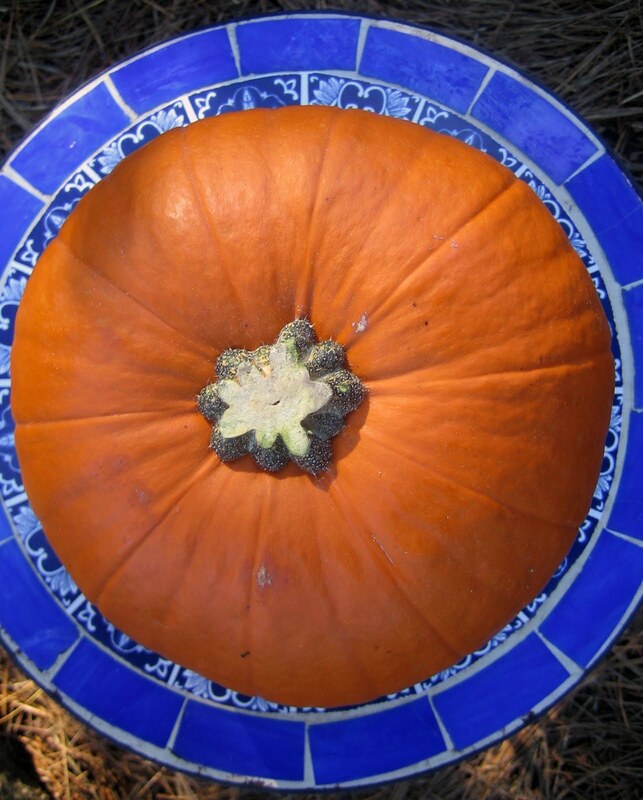 What could be more unprocessed than starting with a whole beautiful pumpkin? I’ve had this pumpkin recipe on my mind for some time now. When I first opened Dorie Greenspan’s Around My French Table, I was drooling over just about every recipe. One in particular leaped out at me, though, and I tagged it for October. She calls it Pumpkin Stuffed with Everything Good, and that about sums it up! 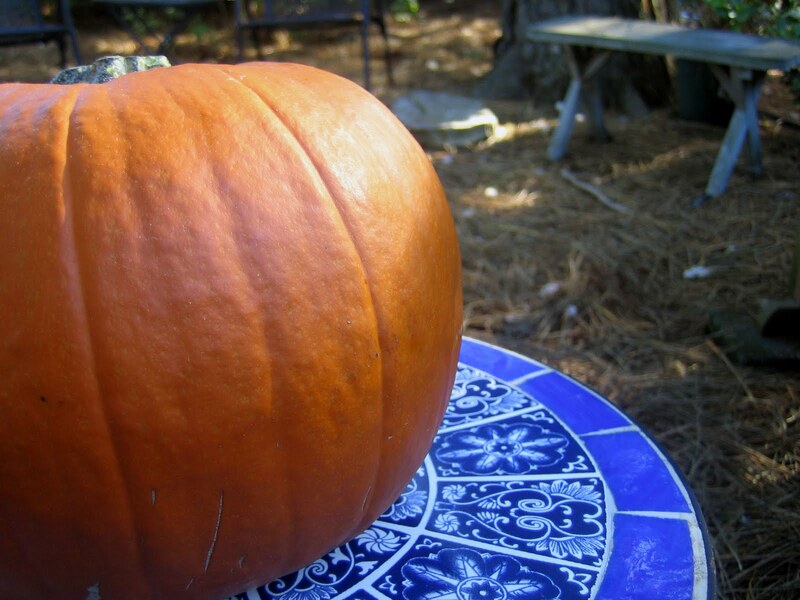 You begin with a whole pumpkin, carve the top out (like a jack-o-lantern), scrape out the seeds and stringy insides -my chickens devoured the stringy stuff - then stuff it with a scrumptious filling. Pop it in the oven and walk away for two hours. That’s it! What emerges from the oven is heavenly. Wedges of roasted pumpkin cradle a savory mix of bread, cheese, cream, herbs and any other tidbits you choose to include. Think Thanksgiving stuffing, and then some (it would make a hearty vegetarian option for the holidays). 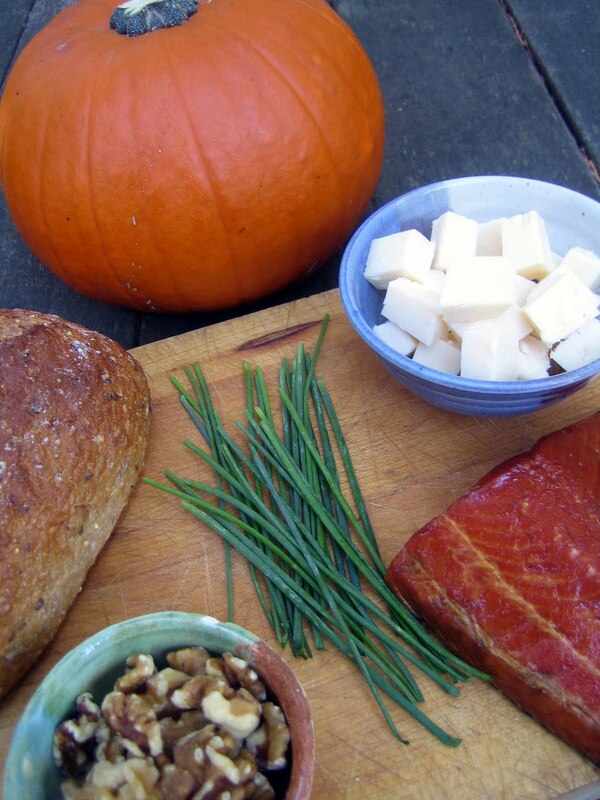 Setting the cooked pumpkin on the table makes a beautiful presentation, and it’s fun to serve the slices from the whole pumpkin. This is a chance to get really creative! The original recipe calls for bacon, so I subbed in smoked salmon and then got crazy and threw in walnuts, mushrooms, chives and pumpkin seeds. This got a thumbs up from Bob! 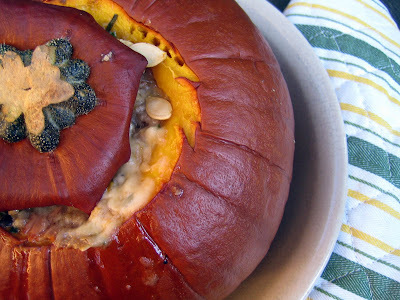 We just finished eating it and I’m already planning my next stuffed pumpkin (diced apples and fresh cranberries ... maybe some grains like barley or nutty brown rice). 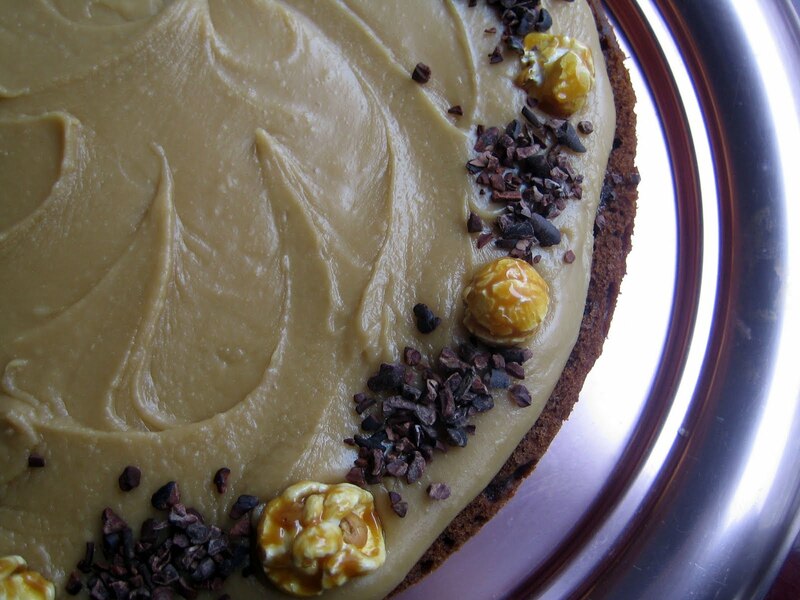 Enjoy playing around with this recipe! Preheat the oven to 350 degrees. Place the pumpkin in a round casserole (I used a deep pie dish) or on a parchment lined rimmed baking sheet. If you bake on a baking sheet, it might be difficult to move the cooked pumpkin to a serving dish, so if possible bake in your serving dish. In a large bowl, toss the bread chunks, cheese chunks, walnuts, salmon, mushrooms, most of the chives and salt and pepper to taste together. I also tossed in a handful of reserved pumpkin seeds. Spoon the mixture into the carved out pumpkin. You may need to pack it down. Drizzle the half and half over and let it soak in. Cover with the lid and pop into the oven. 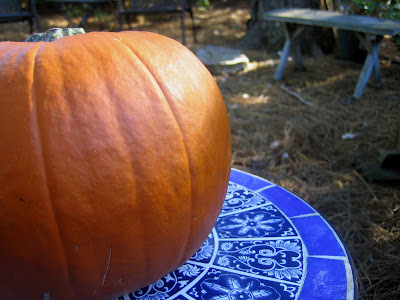 Now forget about it for 1 1/2 to 2 hours, or until the pumpkin is soft when pierced. Remove from the oven and serve in wedges, sprinkled with the remaining chives. 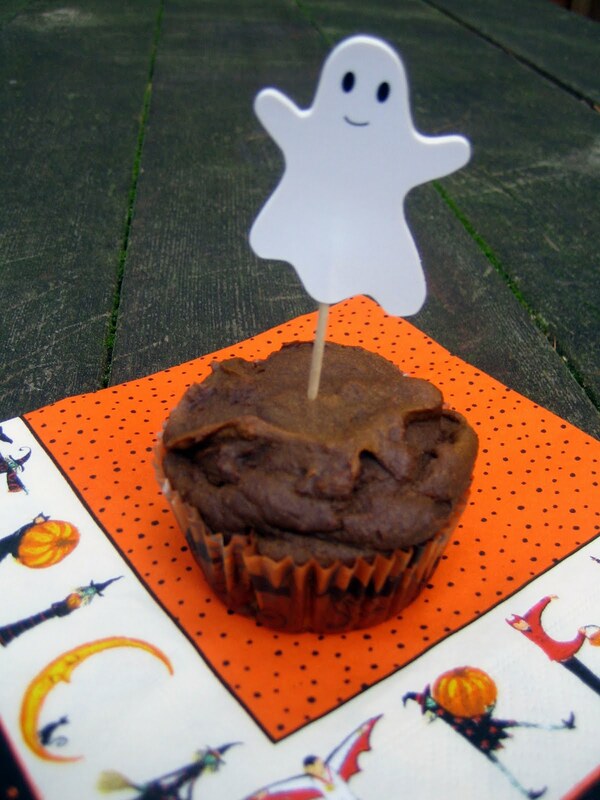 **Depending upon the size of your pumpkin, you may need to adjust the amount of ingredients and baking time. Use your best judgment, this one is not an exact science. 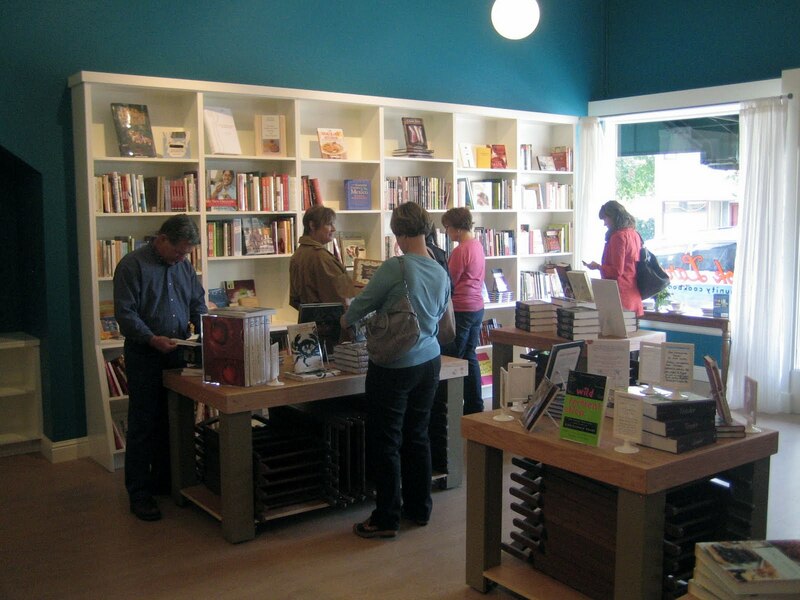 Book Larder Opens in Seattle! Hooray! 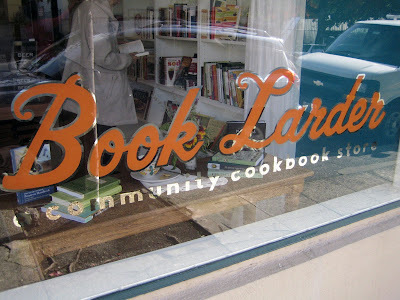 Last Wednesday, Seattle’s first cookbook shop, Book Larder, opened in the Fremont neighborhood. I’ve been counting down ‘til opening day and could not be more excited! 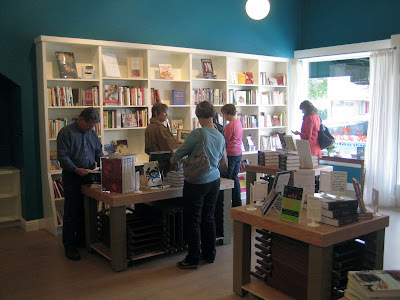 Seattle has such a terrific food scene and to now have a store devoted to selling cookbooks and food-themed writing is a welcome (and, dare I say, long overdue) addition. I popped in for a visit and let out a deep sigh upon seeing the shelves lined with cookbooks. Heavenly! 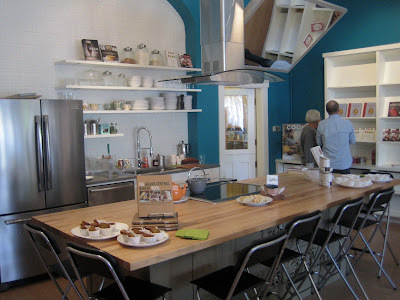 This is such a sweet space, open and airy with beautiful turquoise walls and a helpful and welcoming staff. I slowly meandered, taking it all in. 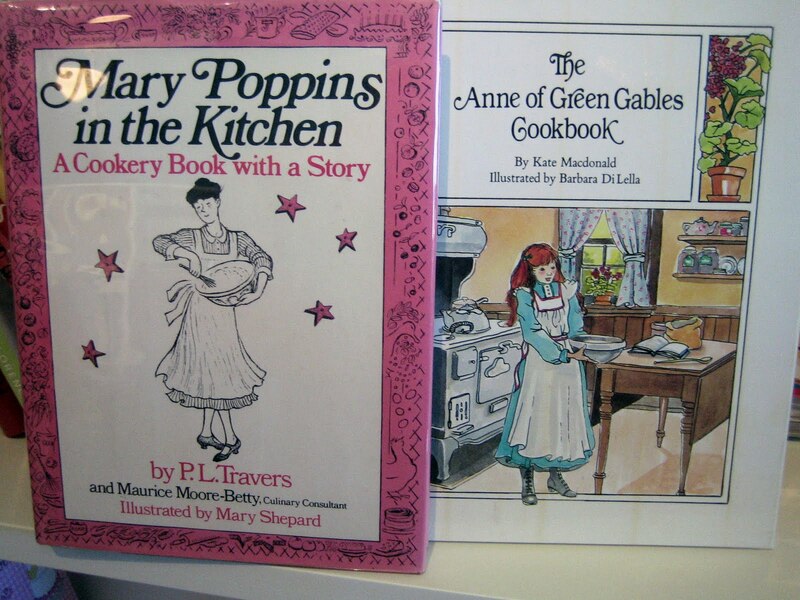 The shelves are filled with books ranging from pickling to baking to gardening to memoirs. There are rare, vintage books and imported titles mixed in with current publications. and check out these two! 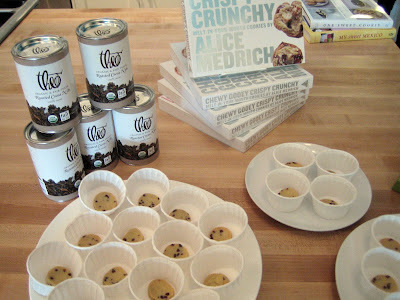 Freshly baked chocolate chip cookies with Theo’s cocoa nibs drew me to the back of the shop. Here there is an inviting open kitchen which will be used for cooking classes and demonstrations. An amazing list of classes and author events is already scheduled. I’m attending a dark chocolate tasting event with Cook’s Illustrated’s Jack Bishop which promises to be a delectable evening. Sigh ... I could use a chocolate tasting this very moment! If you live in Seattle or plan to visit, I highly recommend a stop at this cook’s paradise. 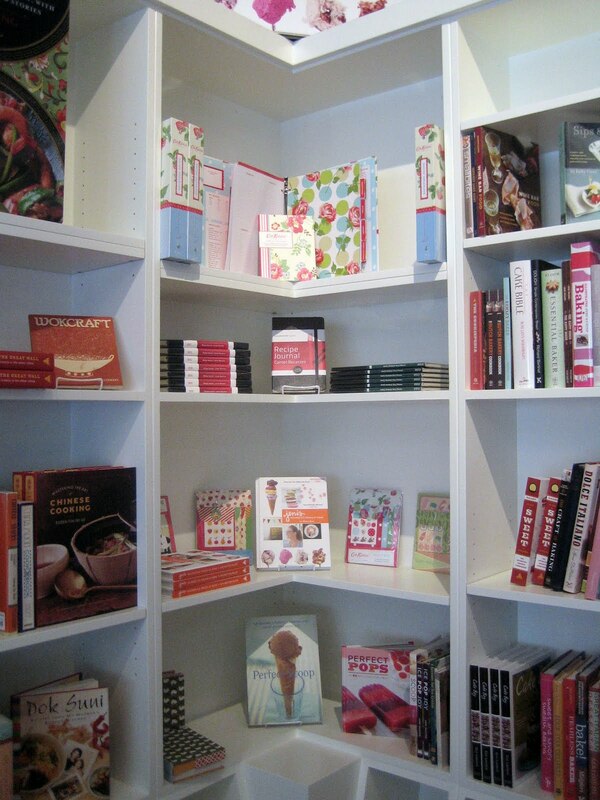 Who knows what you will be dying to make after perusing Book Larder's amazing selection of cookbooks? Stuffed pumpkin is now inspiring me - more details on Wednesday! First the cake! Earlier this week, I entered the Pie vs. Cake Rematch hosted by Jenise Silva at Vermillion in Seattle. Twelve pies and twelve cakes from local bakers were entered to see whether pie or cake is the most popular. Last year, Jenise hosted the first Pie vs. Cake Contest (pie won) and it was so much fun she hosted it again this year. When I first heard about it, I immediately wanted to join in! I normally choose to eat pie (or a pie-like dessert such as cobbler) over cake, but I was feeling inspired by cake. 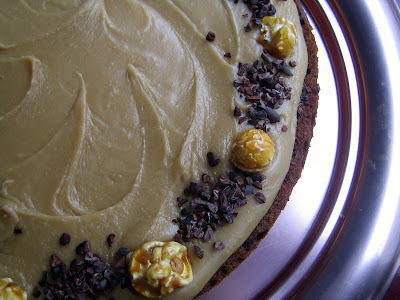 With fall flavors in mind, I created a Pumpkin Chocolate Cake with Caramel Glaze (and caramel corn!). I wasn’t sure what to expect when Bob and I arrived at Vermillion, cake in hand (safely transported in my friend, Julie's, marvelous cake dome that belonged to her grandmother). The room soon filled up as all the bakers arrived and set their baked goods on either the pie table or the cake table. After I set up my cake, Bob and I grabbed drinks at the bar, mingled with the bakers and other guests, and admired the baked creations. These were some gorgeous cakes and pies! Check out some amazing photos of them. Judges were present to taste and vote on the pies and cakes while we chatted and kept a close eye on whichever pastry was at the judges’ table at the moment. There was a mix of excitement and nervousness in the air. Then the announcement came that the judges had cast their votes. We gathered around and clapped and cheered as different bakers were called out. And in the end ... pie was victorious again! Now on to the awards! Recently, a food blogger I admire and enjoy very much passed on two awards to me and I am honored and thrilled! 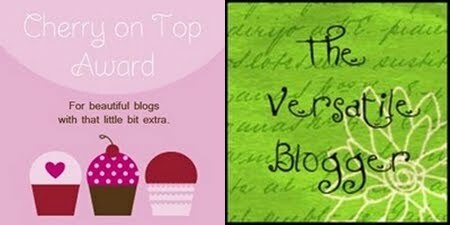 Thank you to Katherine Martinelli for the Versatile Blogger Award and the Cherry on Top Award. 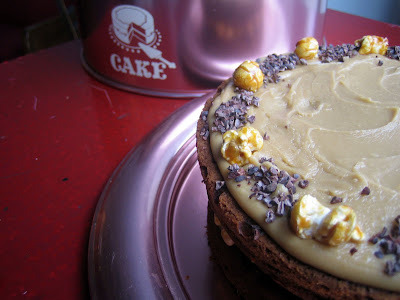 Katherine’s blog is inspiring, with her creative recipes, fun food adventures and stunning photography. 1. I used to be a social worker in foster care and adoption (I have a Master of Social Work). 2. My favorite beverages are sparkling water (love our Soda Stream), kombucha and champagne (I like bubbles!). 3. My brother is in the Foreign Service and his next posting is in Hanoi. Yes, I will be visiting him and eating my way around Vietnam! 4. I’ve been getting into country music and am loving Neko Case’s album The Virginian, especially the title song. 5. Growing up, my heroines were Laura Ingalls Wilder, Louisa May Alcott and Amelia Earhart. 7. My favorite movie is Pride and Prejudice (BBC version with Colin Firth). And my husband and sons have watched it with me, too (and secretly liked it). Now I’m delighted to pass on the Versatile Blogger Award and Cherry on Top Award. I feel fortunate and honored to be part of such an amazing, supportive, gracious blogging community. Thank you to all of you! Preheat the oven to 350 degrees. 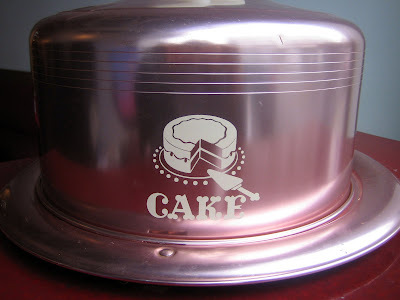 Butter two 8-inch round cake pans and line with parchment paper. Sift flour, cocoa powder, baking powder, baking soda and salt together in a large bowl. 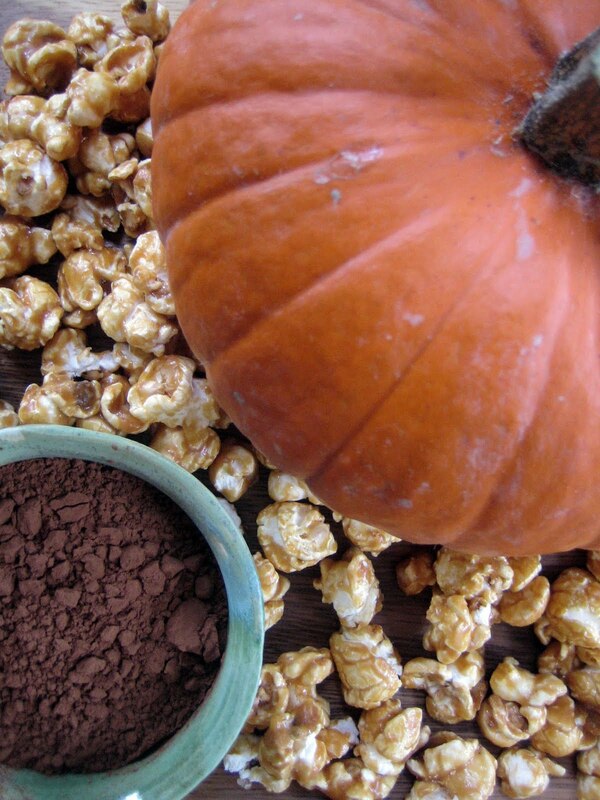 Whisk the pumpkin and milk together in a smaller bowl. Beat the butter and sugars with a mixer until smooth. Add the eggs, one at a time, then add the vanilla. 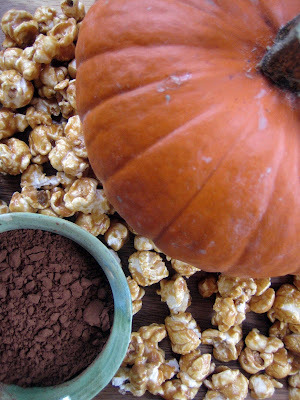 On low speed, add the flour mixture and the pumpkin mixture, alternating between the two. Stir in the chopped chocolate. Divide the batter (it’s a thicker one) between the two pans and spread evenly. Bake for 25 minutes, until a tester just barely comes out clean. Let cool. In a large saucepan, melt the butter and brown sugar together over medium heat. Stir until smooth. Add the milk and let it come to a gentle boil. Remove pan from the heat and whisk in the powdered sugar and vanilla. Beat with a wooden spoon until smooth. 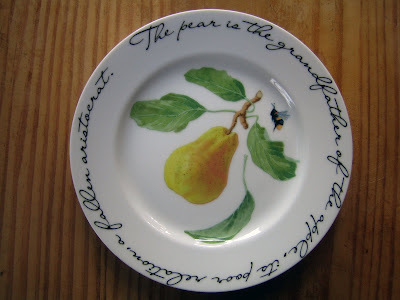 This glaze will harden rather quickly, so be prepared to use it soon. If it does harden, you can soften it with a little more evaporated milk. Place one layer of cake on a serving plate. Slowly pour almost half the glaze over it (it’s okay if it drips off the sides). Sprinkle the 1 cup chopped caramel corn evenly over, then pour a little more glaze on top. Place the second layer of cake over and pour the rest of the glaze over evenly. 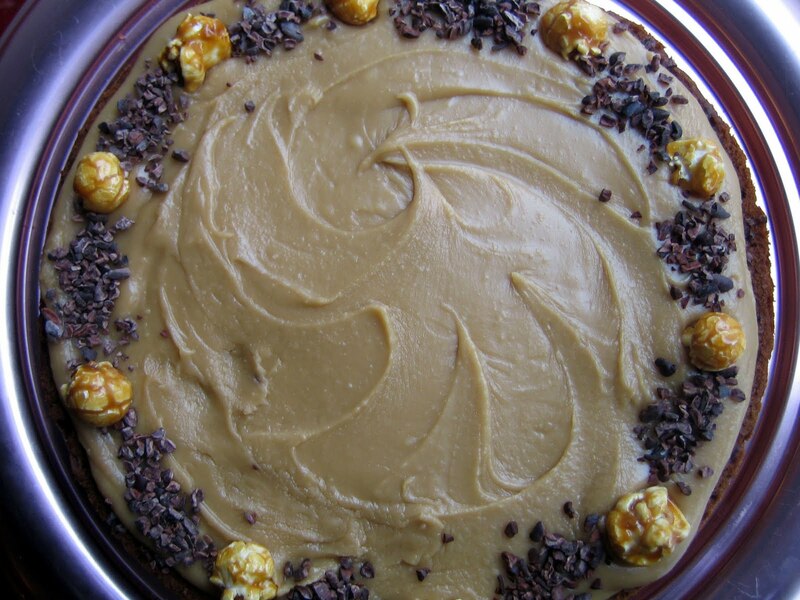 Decorate the top with the whole caramel corn and cocoa nibs. Slice and enjoy! Beautiful pears are popping up at the farmers’ markets and filling the produce bins in the stores. I love their varying shades of red, blush pink, yellow and green. 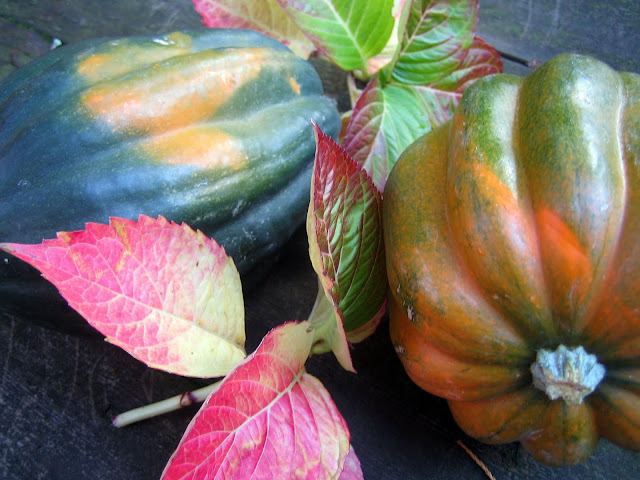 It is truly a lovely fall fruit, delicious on its own and pairing well with other flavors, both savory and sweet. Years ago, I found a recipe in the Seattle Times for Pear, Potato and Cheddar Soup. 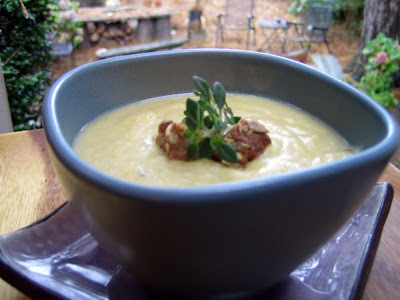 I loved the thought of a savory pear soup and immediately made it. 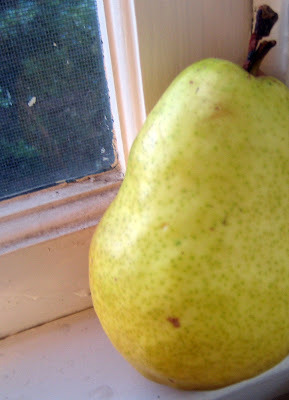 Pears, Yukon gold potatoes, onions and celery are sautéed in butter, then simmered in broth. After pureeing it all into a smooth mixture, you add cream and cheese. Need I say more? This is a delightful soup and is hands down our favorite to slurp during the fall months. 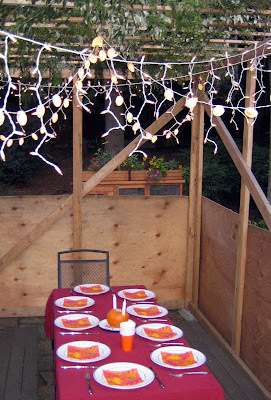 Pear, Potato and Cheddar soup also makes a regular appearance in our sukkah each year. Tonight begins the Jewish holiday of Sukkot. Sukkot is an agricultural holiday, celebrating the harvest. Temporary structures, called sukkahs, are erected to represent the ancient temporary dwellings needed to live in while harvesting the fields. Sukkahs also symbolize the tents that Jews lived in during the forty years of wandering the desert after leaving Egypt. Every year, we build a sukkah in our backyard using wood to create the sides, and branches cut from our bushes and trees for the roof. We string little lights, move our picnic table in, and live in the sukkah as much as possible for a week. In Seattle, that can be a challenge! Some years, we are quite bundled up while eating outside, other years we are enjoying balmy evenings and savoring the last moments of summer. I am always so thankful if the rain holds off until Sukkot is over! We’ve already had heavy rain and wind this week, but the sun is peeking out now so I’ll keep my fingers crossed. When it’s a clear night, I love to look up and see the stars peeking through the branches. Such a cozy feeling! 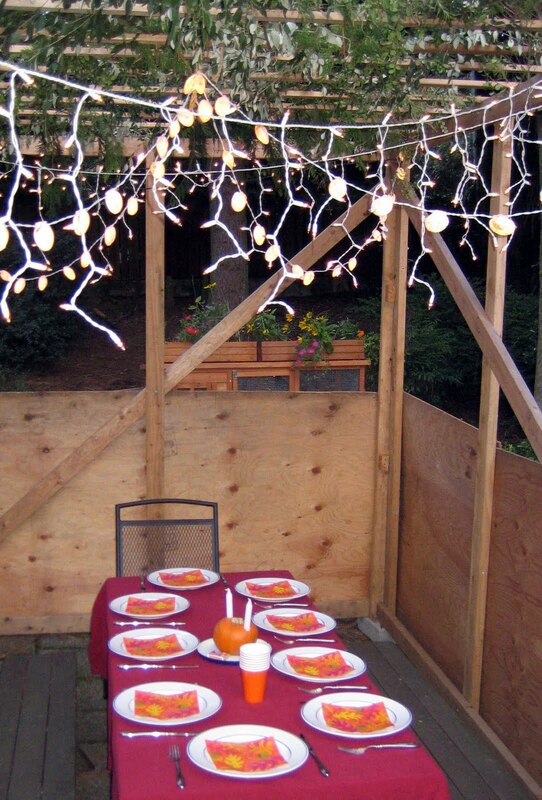 No matter what the weather is, Sukkot is always a fun family holiday to share with guests, and a last hurrah for eating outside before winter arrives. 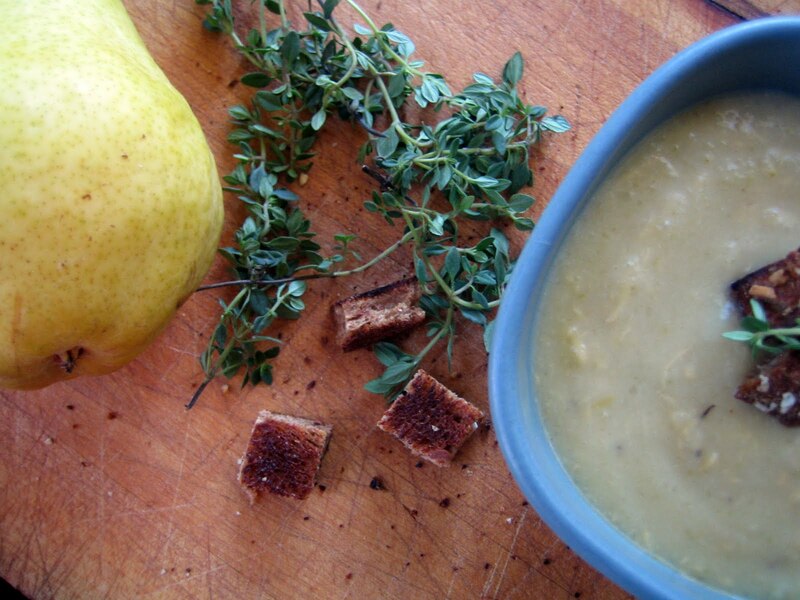 This creamy pear soup will warm you while snuggled in a sukkah or sitting around your dining table. its poor relation, a fallen aristocrat." In a soup pot (I use an 8 quart size), melt the butter and sauté the pears, potatoes, celery, onion and thyme until soft, about 5-7 minutes. Add the wine and cook for a couple of minutes. Add the broth and bring to a boil. Reduce heat and simmer for 30 minutes. Using an immersion blender, puree the soup until smooth. Slowly mix in the grated cheese, cream or half and half and salt to taste. Stir until smooth and cheese is melted. If soup is too thick, add a little more broth. Heat until warm but do not boil. Ladle soup into cups, garnish with croutons if using, sip and enjoy! Yesterday, I had the pleasure of meeting some new friends here in Seattle. We all participate in the marvelous cooking site Food52 and decided it was time to have a meetup. Arriving from Gig Harbor, Sumner and Seattle, WA, Portland, OR and even Berkeley, CA, we met in person and shared our love of food, cooking and eating. Nine of us (including the lovely daughter of one participant who received the news of an amazing cooking job minutes before we arrived!) gathered around a beautiful table spread with whatever dishes we had been inspired to create. We spent the afternoon sipping Prosecco and homemade shrubs mixed with seltzer. We tasted little tarts with roasted golden beets and hazelnuts, pickled prunes, marinated eggplant, polenta cups stuffed with tomatoes, Italian sausages, wraps filled with cheese, basil and roasted peppers and roasted root vegetable pot pie. We indulged in lemon coconut cookies, chocolate dipped dried pears, rocky road bars, pear rosemary Danish, pumpkin oat cookies and chocolate chip cookies. The table buzzed with the sounds of laughter and chatting, plus occasional sighs of delight. It was truly a wonderful Sunday afternoon. I appreciate meeting such gracious, kind, interesting, talented women! We plan to meet again soon and hope to include more Pacific Northwest friends. Roasted Root Vegetable Pot Pie was one of my contributions. The pie consists of a medley of root vegetables which are roasted with olive oil and maple syrup, and covered with a flaky cheddar biscuit crust (much like a cobbler). 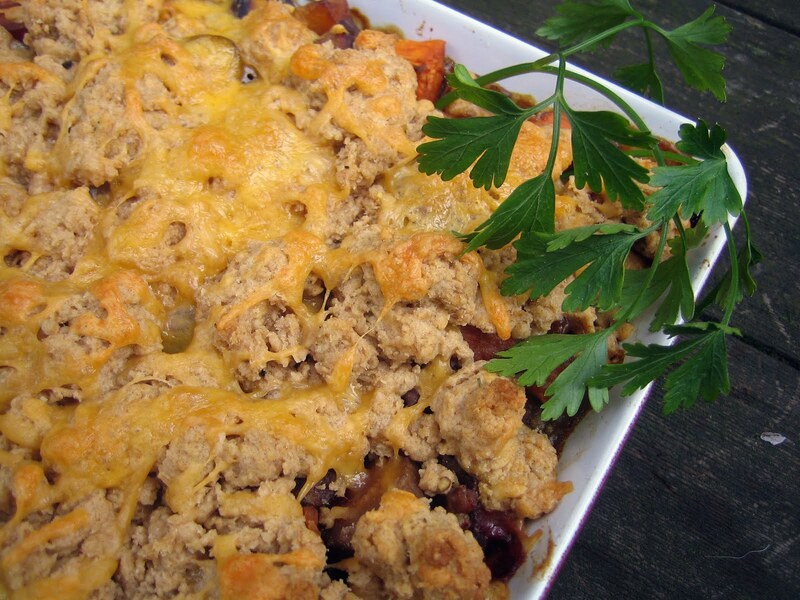 It can be prepared in steps ahead of time, serves a crowd and makes a hearty entrée to enjoy on a fall evening. Preheat the oven to 400 degrees. 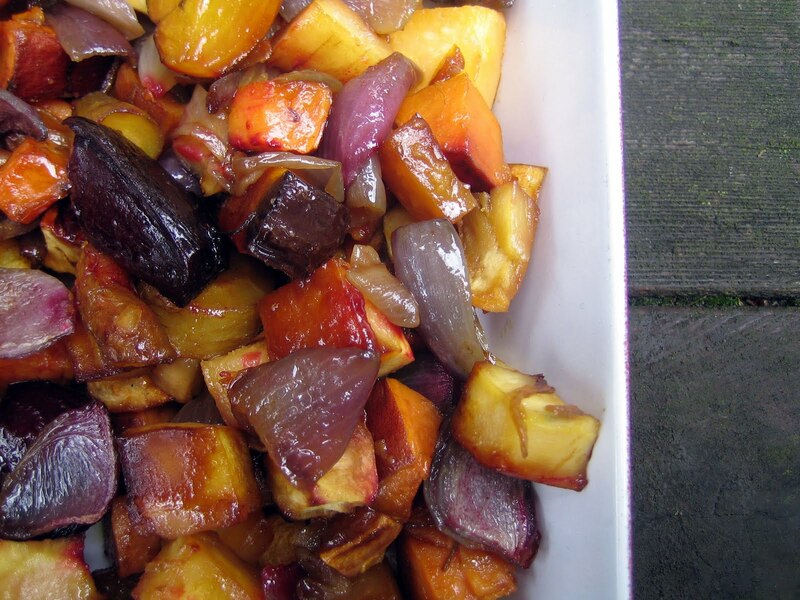 Toss the veggies, maple syrup and olive oil together in a bowl, then spread on two rimmed baking sheets. Roast the veggies in the oven for about 45 minutes to 1 hour, until they are soft but still a little firm. Rotate the baking sheets and stir a few times (I’ve also piled all the veggies on one rimmed baking sheet and as they roast they shrink down. Stir often if you choose this method.) This step can be done one day ahead. Cover and refrigerate if making ahead. Transfer the roasted vegetables to a 9x13 baking dish. Pour the vegetable broth over the veggies. Sprinkle the thyme, 1/2 cup whole wheat flour and 1 teaspoon salt in and gently stir to combine. Cover the pan and bake for 25 minutes. In a medium bowl, stir together the remaining 1 cup whole wheat flour, 1 cup all-purpose flour, baking powder, remaining 1 teaspoon salt and some pepper. Cut the butter into little pieces and mix in quickly (I use my fingertips). Stir in the cream to create a biscuit-like dough, then add 3/4 cup of the shredded cheese. Uncover the veggies, stir gently and drop the dough in pieces on top evenly. Sprinkle with the remaining 1/4 cup cheese. Bake for 20 minutes, until golden brown. Serve warm or room temperature.